1. Heat at least 5 cm vegetable oil in a deep fat fryer or heavy-bottomed saucepan, until it reaches 180°C, or until a piece of bread browns in 10 seconds. Mix 3 tablespoons of the granulated sugar and 1/4 teaspoon of the cinnamon in a medium bowl. 2. Cook the tortillas, in batches, in the preheated oil, for 1 minute on each side, turning halfway through, until lightly brown all over. Remove from the oil and drain the tortillas upside down on a paper towel-lined baking sheet, for 3-4 minutes, then add into the cinnamon sugar to coat. Remove and cool fully on wire racks. 3. Stir the soured cream together with 1 tablespoon of the remaining granulated sugar and 1/4 teaspoon of the cinnamon, in a small bowl, until combined and place to one side. 4. Meanwhile, heat a large frying pan and cook the apples, brown sugar, lemon juice, remaining 1 teaspoon of cinnamon and the salt over a medium-high heat. Cook for 15 to 20 minutes, stirring occasionally, until the apples are tender. 5. 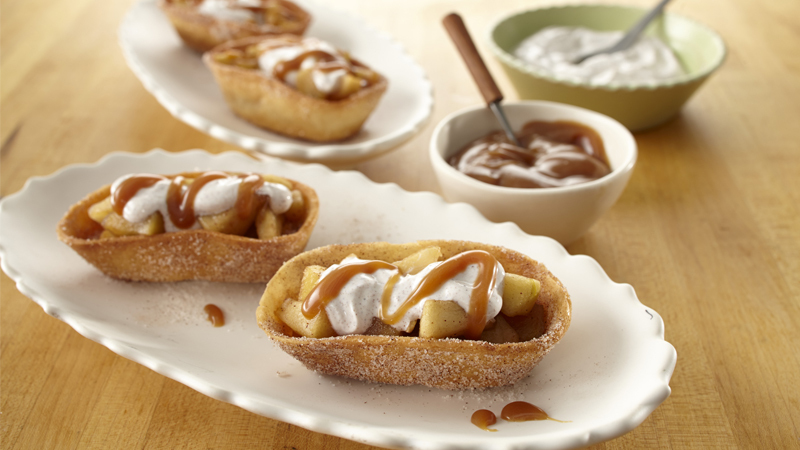 Divide the apple mixture between the fried tortillas then spoon over the cinnamon cream and drizzle with the caramel sauce. Melted dark chocolate works equally well as a delicious drizzle with these cinnamon flavoured apples. Alternatively why not try using pears instead of apples.